Announcing the 2017 ISEE-Akamai Mentor Workshop! Akamai Mentors and their interested colleagues are encouraged to apply. Friday, May 19 & Saturday, May 20, 2017. 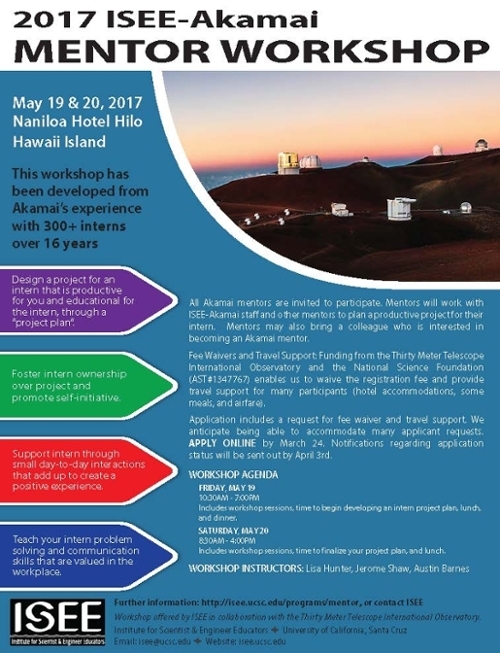 - This workshop is offered by ISEE in collaboration with the Thirty Meter Telescope International Observatory, and with funding from the National Science Foundation (AST#1347767).